A southern species with most records lying below a line joining the Severn and Humber estuaries. In Wales only from the south east. 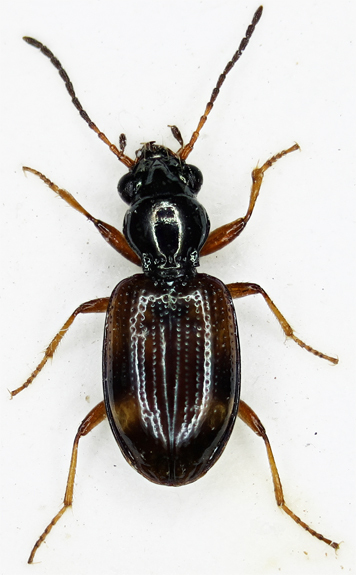 Adults typically occur on open damp ground near water, this being the case on Common moor where from April onward they are present, in company with other Carabids, in large numbers. They are active in bright sunshine, move very quickly and vanish under debris or into cracks in the soil when disturbed. From early spring they can be found throughout the Watford area on damp soil among waterside vegetation, including among the deep reed-litter at Radlett road. They remain common until at least July. Adults are fully winged and probably disperse considerable distances; a single male came to MV light on a horizontal sheet in a town centre garden early in May 2007. They breed in spring and summer. 2.9-3.9mm. Antennae with at least 3 pale basal segments, most of the fourth also usually pale. Last segment of maxillary palpi cylindrical, tiny compared with penultimate. Head and pronotum black with shiny green reflection. Head impunctate but for setiferous punctures inside eyes. Clypeus with a deep furrow from hind margin of eye to base of labrum (cf octomaculatum). Pronotum with longitudinal central furrow, strongly constricted to base, lateral border visible from above to front angles. Hind angles sharp. Basal fovea deep and well defined, two deep impressions between these and centre of base. Elytra with seven strongly punctate striae disappearing behind middle, third striae with two weakly foveate punctures. Dark with many elongate lighter marks which form more or less a distinct macula posteriorly and broad,obscurely deliniated fascia from shoulders to middle (cf octomaculatum). Elytral margin continuing smoothly around shoulder. Legs light brown with femoral apices darkened.